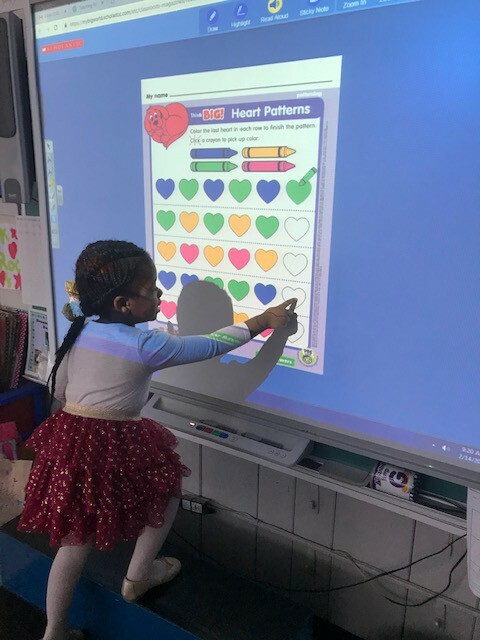 This month, we celebrated Black History Month, Valentine's Day, Kindness Week, the 100th Day of School, Go Red for Women Day, Presidents' Day weekend, a visit from CBS News Meteorologist, John Elliot, countless student successes and so much more! 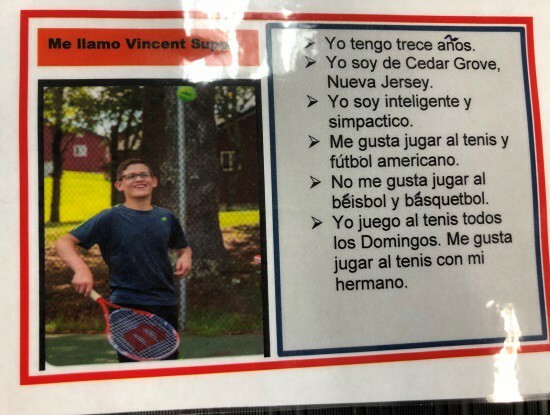 In this edition of the CGSD Newsletter, you can learn about SiLAS, our MMS interactive social skills program that uses avatars to help kids with social skills; celebrate and learn more about the grant we received at South End School from Active Schools/Movement Academy for the Active Classroom Program; get involved with the Kindness for Christopher Program; support Just One Africa's mission to care for orphans and vulnerable children in Kenya by providing clean water and other resources; and explore the many creative and innovative learning activities guiding our students towards college and career readiness. 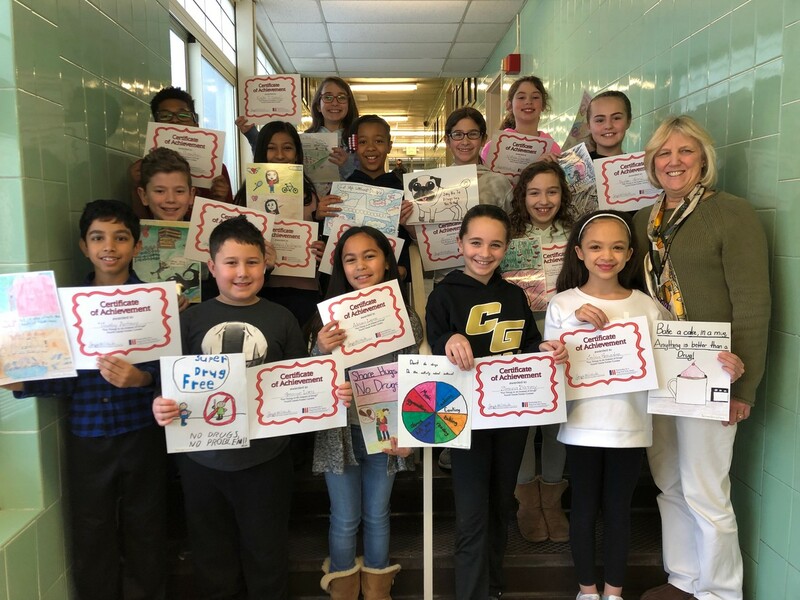 South End 4th Graders received Certificates of Achievement after participating in the 4th Grade Folder Contest sponsored by the Partnership for a Drug-Free New Jersey. 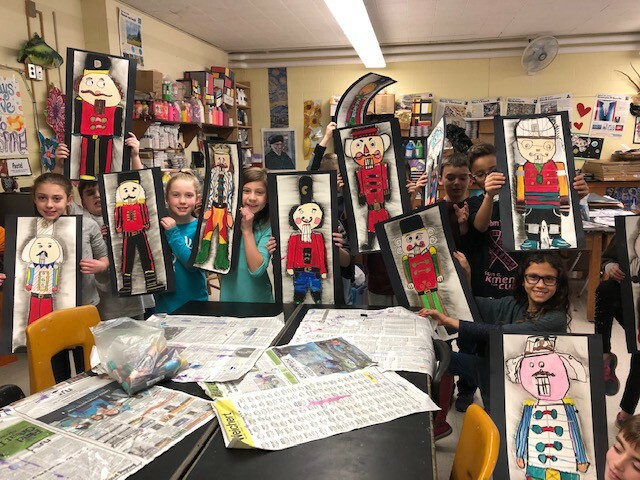 Their artwork displays the theme "Fun Things to Do Instead of Drugs." This project was coordinated by Dale Lohmann, RN. Mrs. Lohmann, SE School Nurse, received a grant from Active Schools/Movement Academy for the Active Classroom Program. 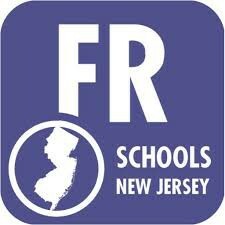 The grant enables SES access for all grade levels to use the program for the remainder of this school year. 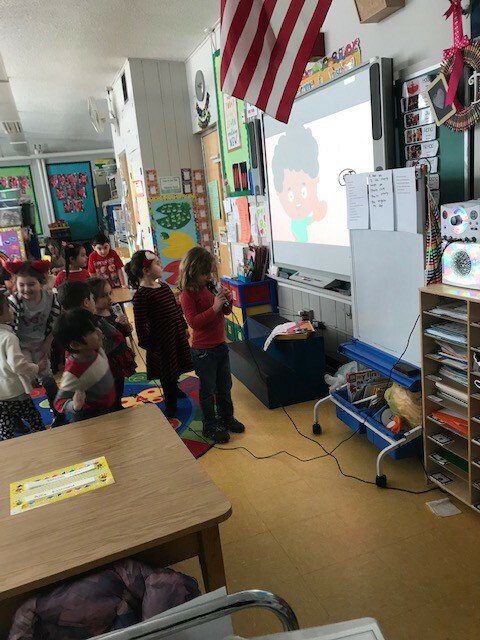 The Active Classroom Program is designed to be used at any time of the day when a teacher feels the need to introduce a 3-5 minute physical activity break. All movements are done sitting or standing next to one's desk. 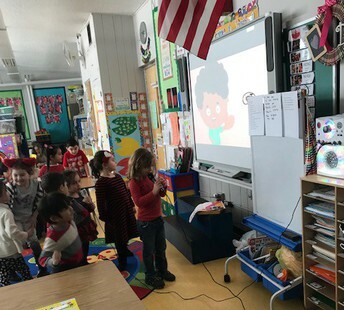 Teachers all use some type of activity program for students' important brain breaks and this grant will certainly add another resource teachers can log in to and utilize in their rooms with their children. 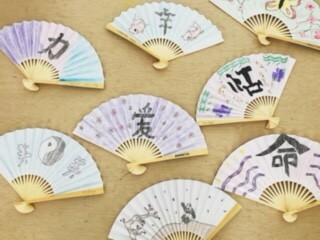 The exercises are updated each week. 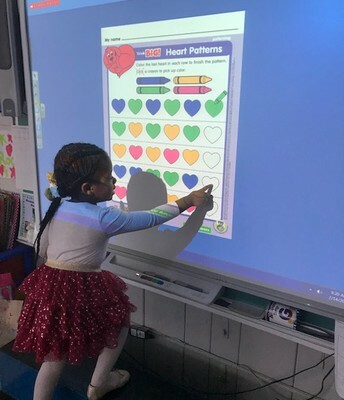 What a wonderful tool to help keep our kids moving! For more information about the Active Classroom Program, please visit. 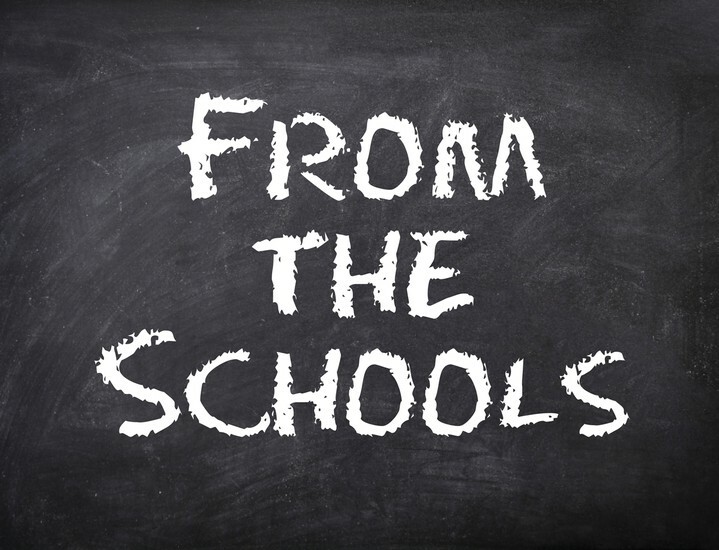 https://champion.activeschoolsus.org/active-classrooms. 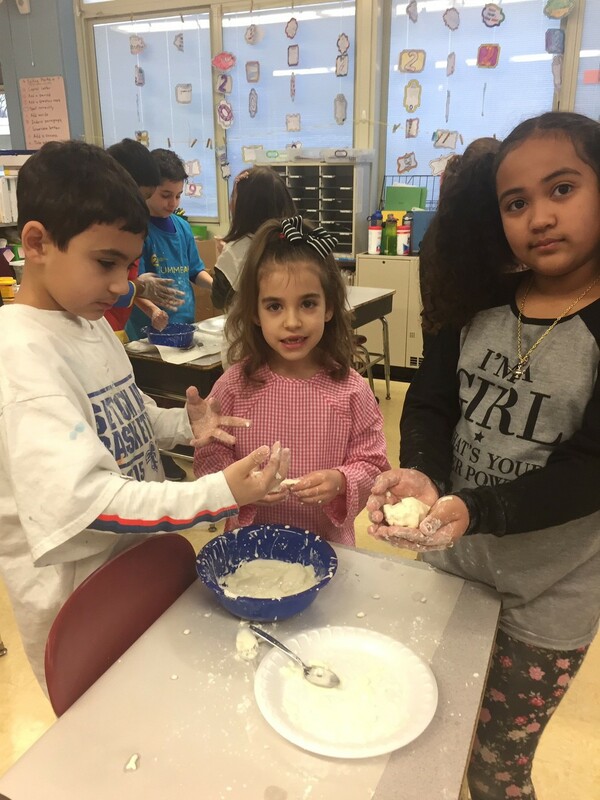 SE 3rd graders have been studying Weather in Science. 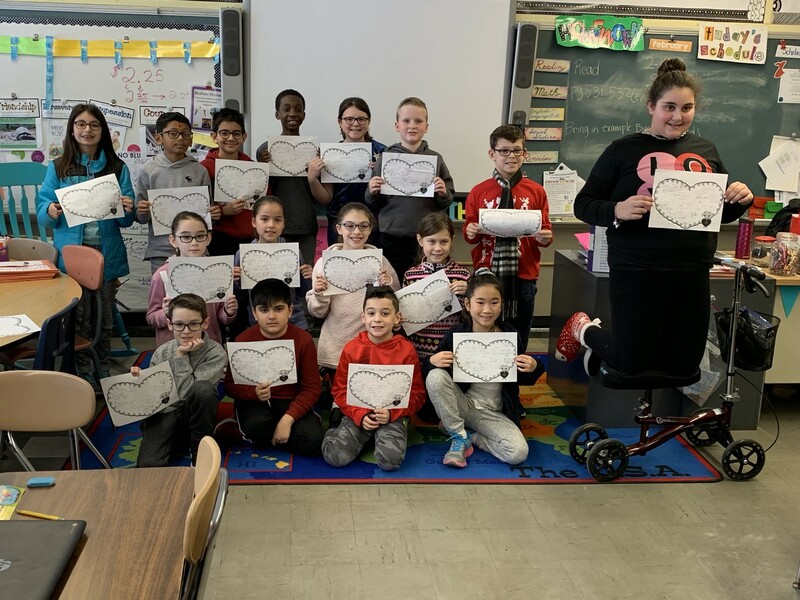 They learned about the components of a weather report, a weather map, a weather forecast, the tools meteorologists use to predict the weather, the water cycle and three basic cloud types. 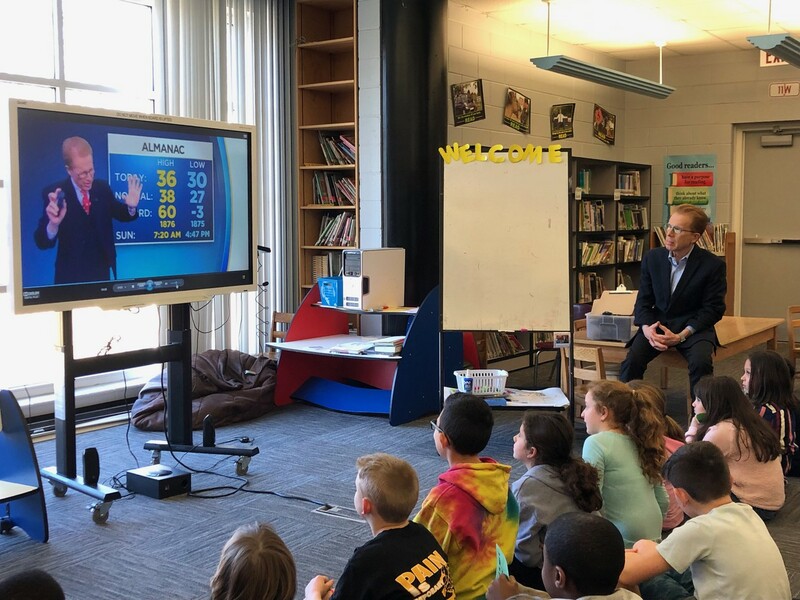 Students created their own weather forecasts in class, but what better way to end a unit of study then to have an expert in the field of meteorology visit? 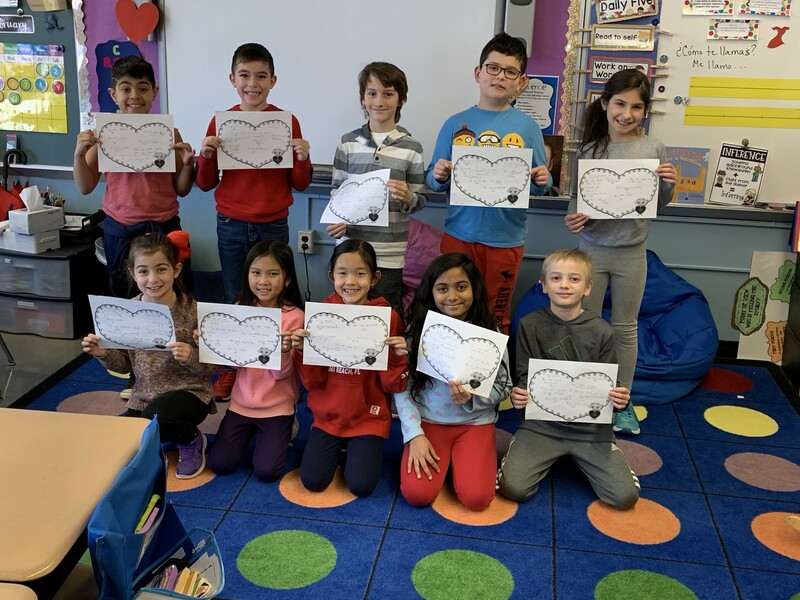 That's exactly what happened on February 8 when Channel 2 Meteorologist John Elliott visited South End after receiving a letter from one of our third graders requesting he visit and talk to them all about weather. 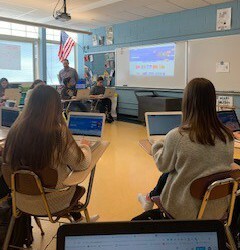 Mr. Elliott shared his knowledge and went into detail about how TV broadcasts are made, the basic types of clouds, high and low pressure and his own personal stories with different types of weather. 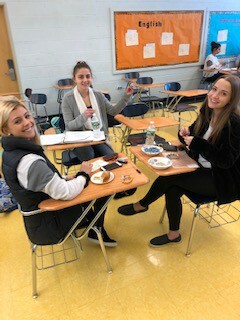 What a perfect ending to a unit of study! 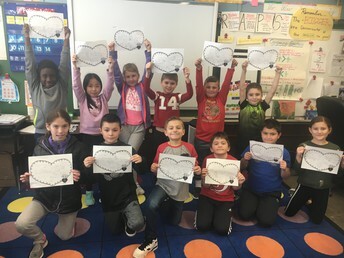 At NE, Mrs. Scuralli’s first grade class collaborated with Mrs. Caruso and Ms. Monto’s second grade class by completing a "close read" of non-fiction text to develop vocabulary and comprehension skills. 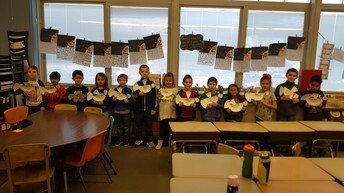 This learning experience about snowflakes culminated with an Edpuzzle activity. How cool is that?!?! 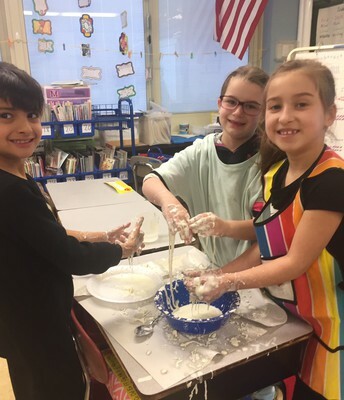 NE 2nd graders investigated the states of matter and the special properties of Oobleck. 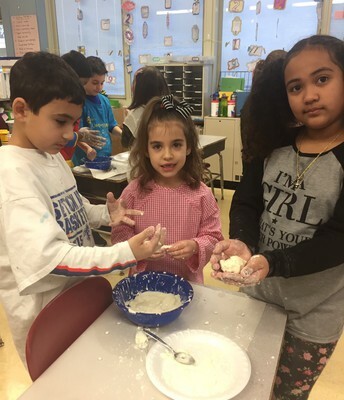 They discovered that they could squeeze this apparent liquid and it would form a solid ball. 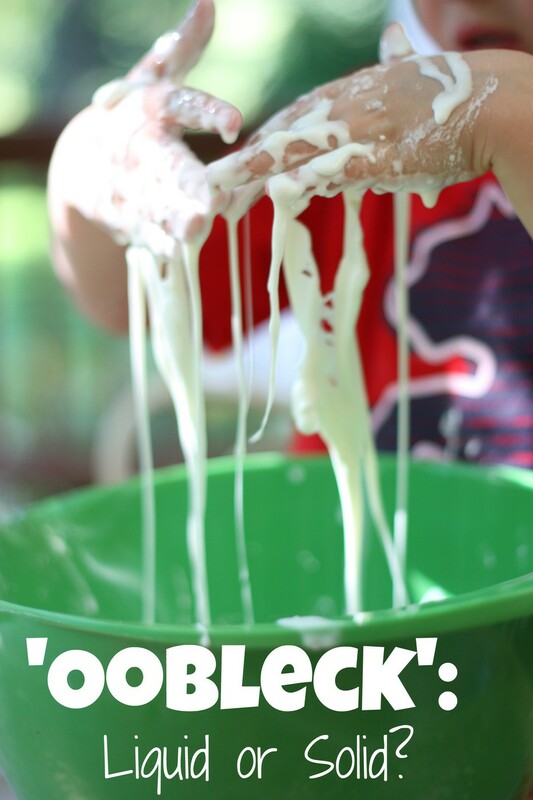 If they relaxed the pressure, the solid would seem to melt in their hands into a puddle and pour through their fingers. 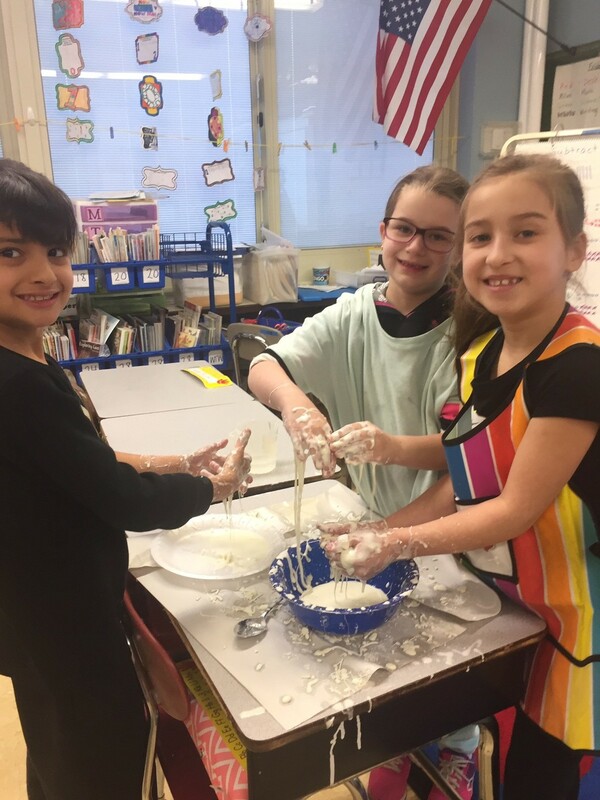 Students learned later that Oobleck is a special liquid called a Non-Newtonian fluid that flows at a different rate based on the pressure applied to it. 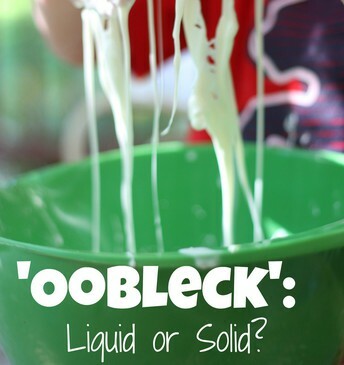 With pressure, Oobleck acts like a solid, with less force, it acts like a liquid. 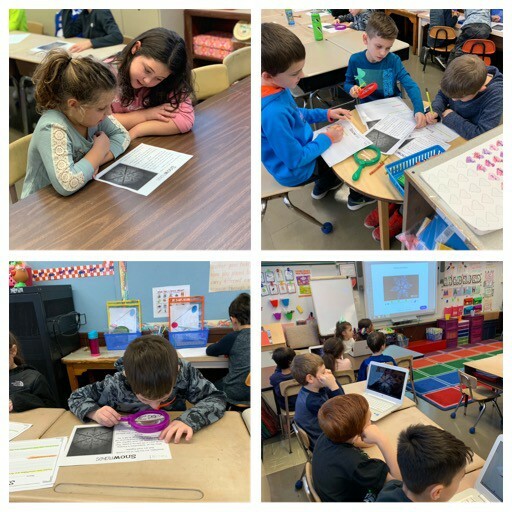 Our second graders found this inquiry activity both fascinating and exciting! 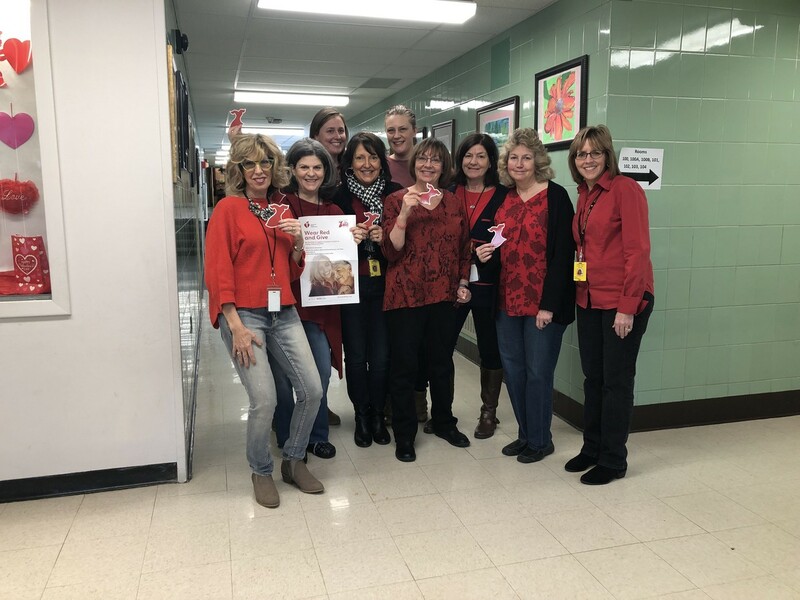 NE School staff participated in The American Heart Association's "Go Red for Women Day". 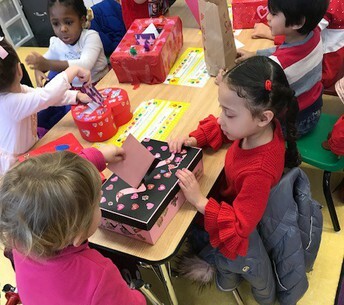 They wore red and contributed a total of $145 for the prevention of heart disease and stroke in women. Unfortunately, every 80 seconds a woman dies of heart disease or stroke. "Every 80 seconds counts!" Please visit goredforwomen.org to obtain valuable information concerning prevention. 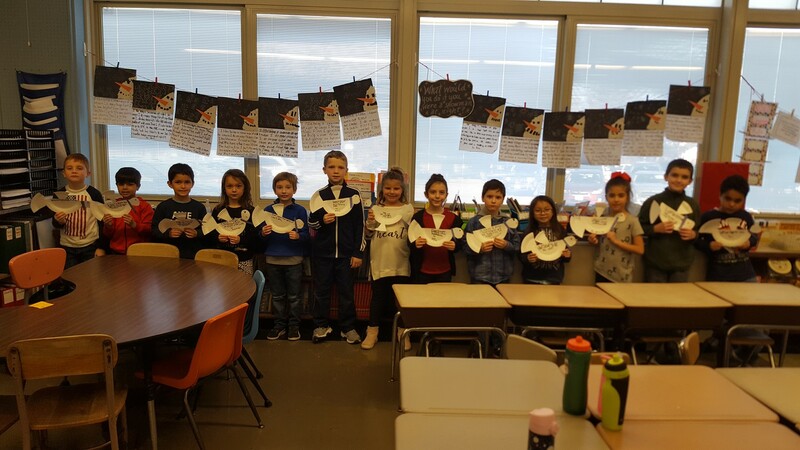 NE students, after reading Snowmen at Night by Caralyn Buehner, wrote narratives about what they would do if they were snowmen/snowwomen at night. They're also holding "I Have a Dream" doves in honor of Martin Luther King. 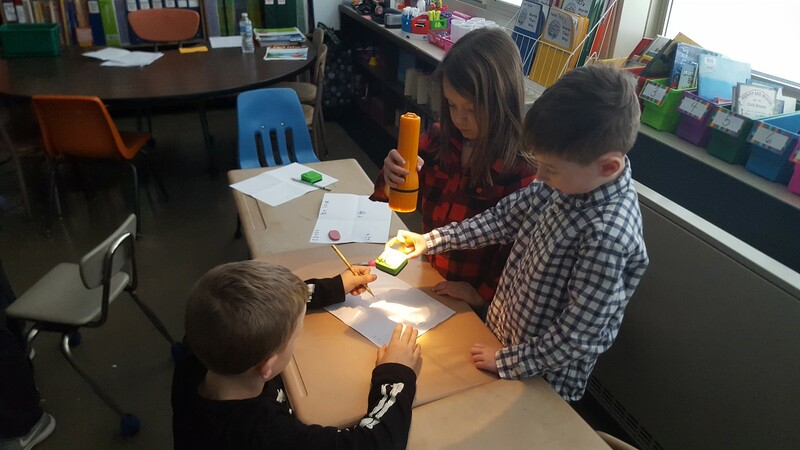 NE first graders investigated the relationship between light and shadows. 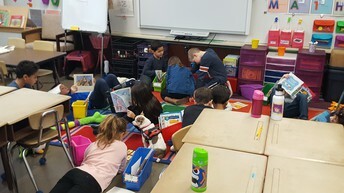 NE first graders' favorite visitor, Lila the Therapy Dog, loves reading as much as they do! 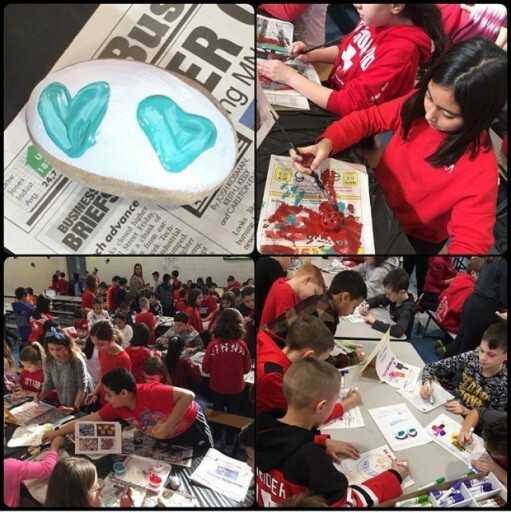 As part of the “Kindness for Christopher” program, the SE and NE School Climate Committees created activities that will be held on or around the 24th of each month to encourage the kindness that Christopher perpetuated (www.facebook.com/kindnessforchristopherd). 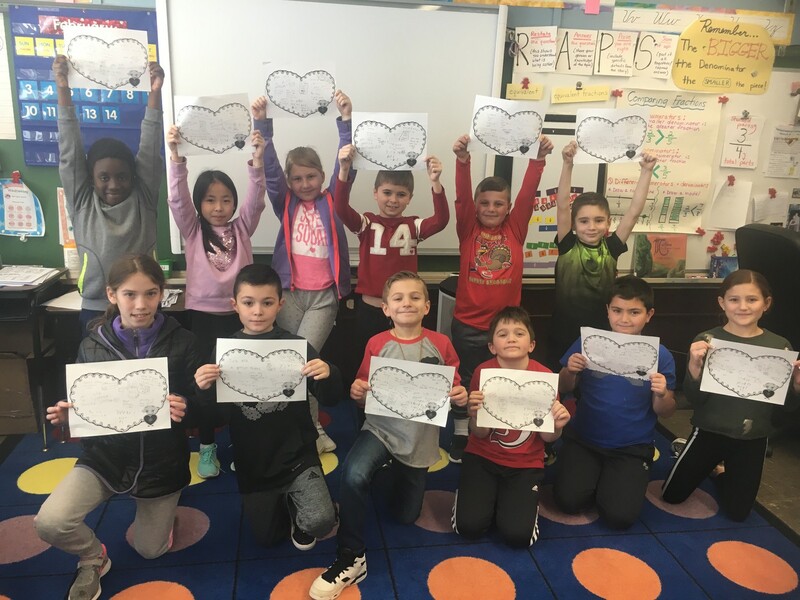 A special activity was held on February 14 where students created placemats covered with compliments and kind words for their classmates! NE and SE students created large heart compositions based on the artwork of Jim Dine, with special emphasis on color and pattern! 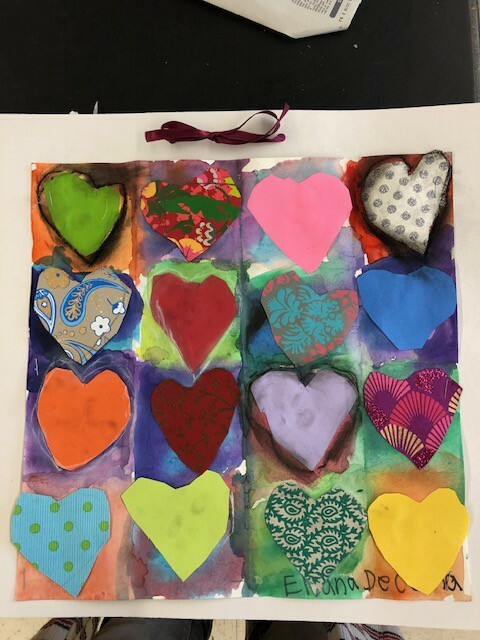 Quilted heart creations involved the use of solids and patterns and gluing in a "checkerboard" fashion. 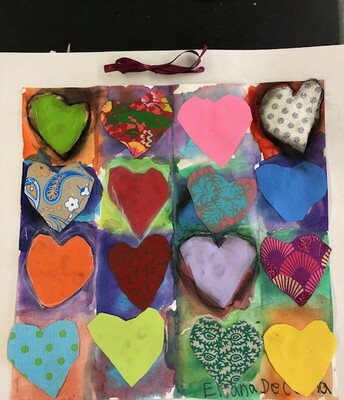 First grade students also added charcoal and knowledge of blending to add depth and dimension to each piece. Large, whimsical "Nutcrackers" were designed by fourth graders, infusing knowledge of proportion in dividing characters...fun for all! MMS Students Welcome SiLAS ! 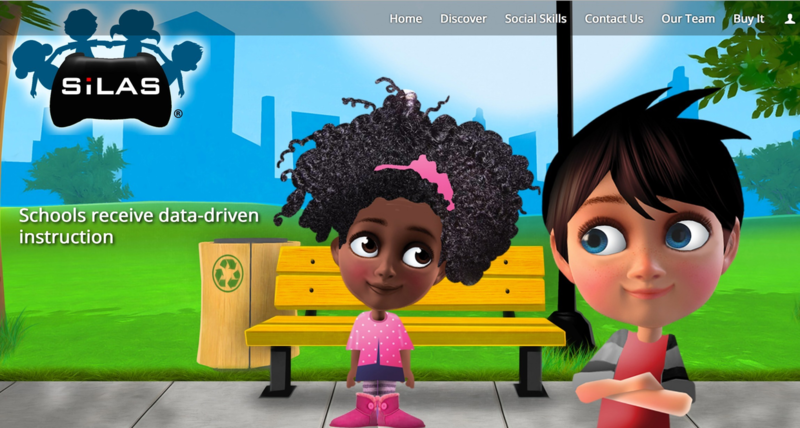 SiLAS is an online, interactive social skills program comprised of a four step process: students write a script, act their scripts out through their avatars, revise and edit their movie, and share their movies with different stakeholders. SiLAS can be used both to develop certain skills that students may be struggling with, along with on-the-spot conflict resolution during the school day. 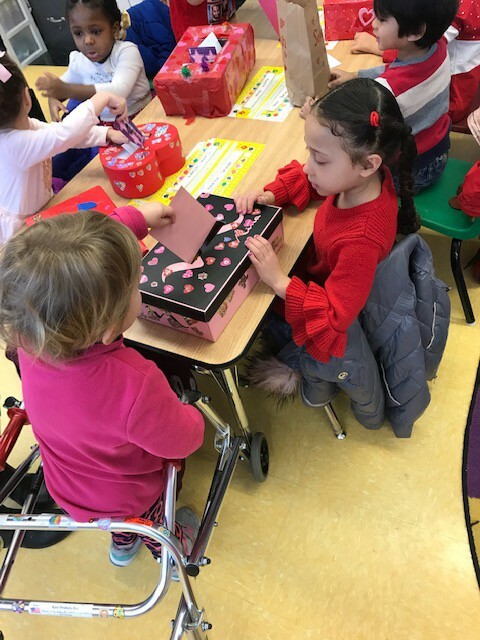 The program has a social skills curriculum which addresses topics across different age groups that range from conflict resolution skills, to proper conversation skills, to taking turns ... and much more! Visit https://www.silassolutions.com/ for more information. 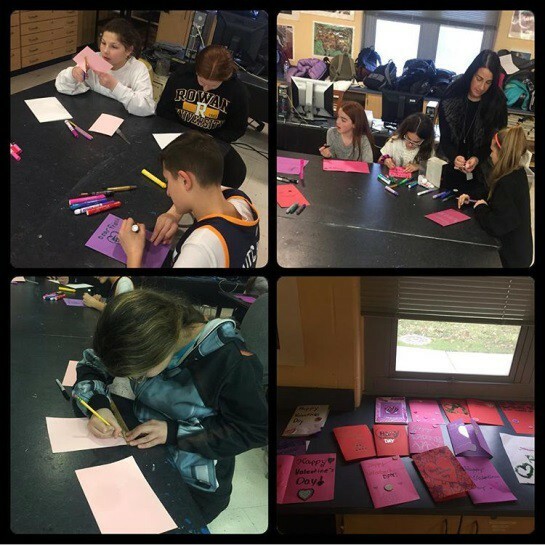 Members of the MMS Random Acts of Kindness Club created Valentine cards for residents who reside at a local facility. The club adviser, Miss C, dropped them off to bring love, joy and smiles to others! 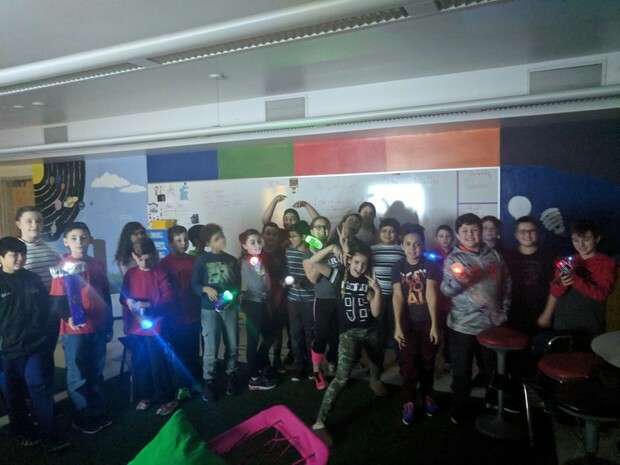 MMS 5th grade S.T.E.M. finished up the ¨Lost Light" project. Students created a number of different inventions to solve problems and used their exploration of circuits to create designs, either handheld or wearable. 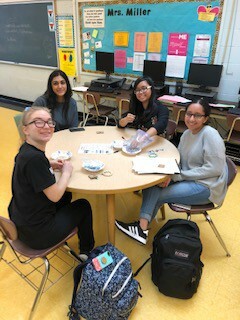 Throughout the project, students discovered the properties of circuits, resistors, switches and materials that serve as conductors or insulators of electrons via a hands on approach to learning. 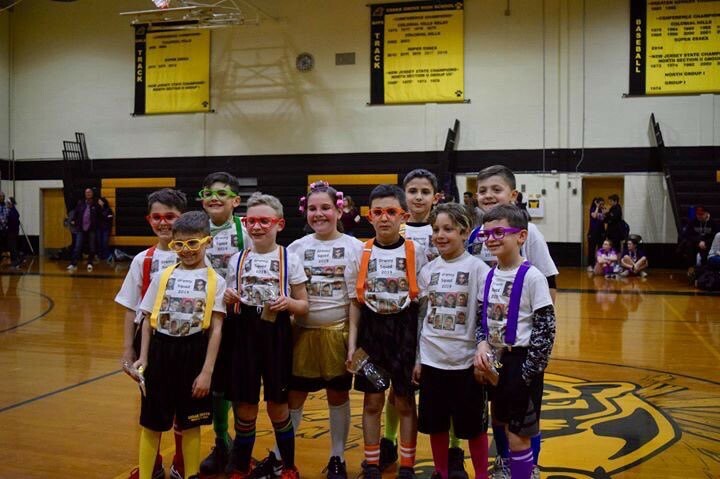 The 7th grade S.T.E.M. class finished up the "Wind Farm Blade" project. 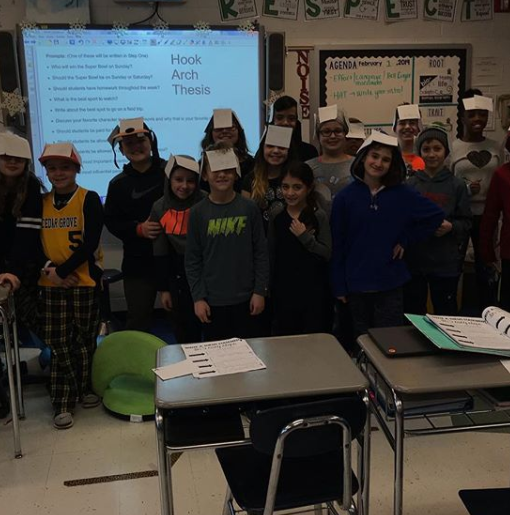 Students researched how a wind farm blade is used to create sustainable energy and the ideal dimensions and characteristics necessary to run efficiently. Students then used www.tinkercad.com to design their own miniature 3D printed version which could lift a binder clip. 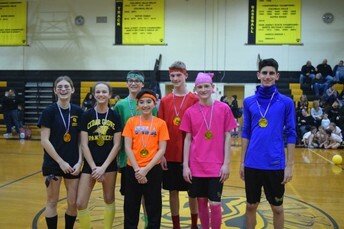 The challenge consisted of students creating 3D printed designs and their own unique website using Google Sites. See the videos below of a couple of wind farm tests - so cool! 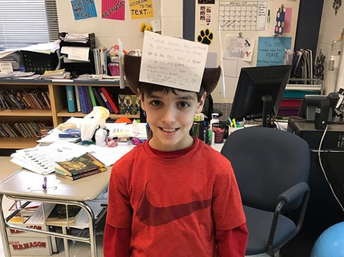 MMS 5th grade language arts students have been using the acronym "HAT" to learn how to write an introductory paragraph in a five paragraph essay. 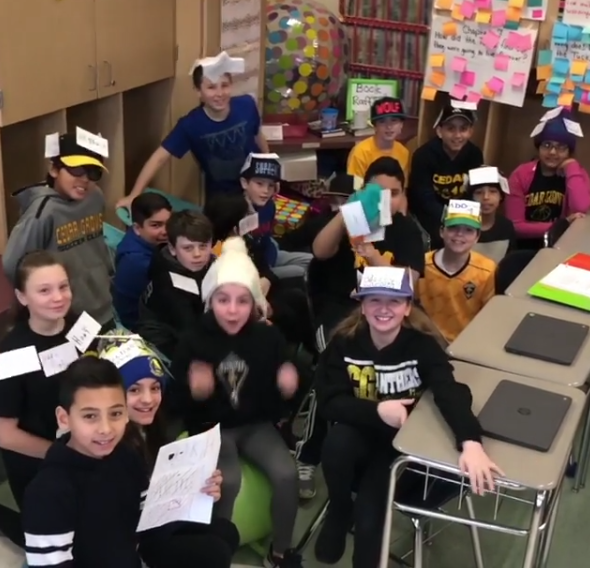 Students brought in hats and collaborated to write strong hooks, topic sentences and thesis statements using our acronym. 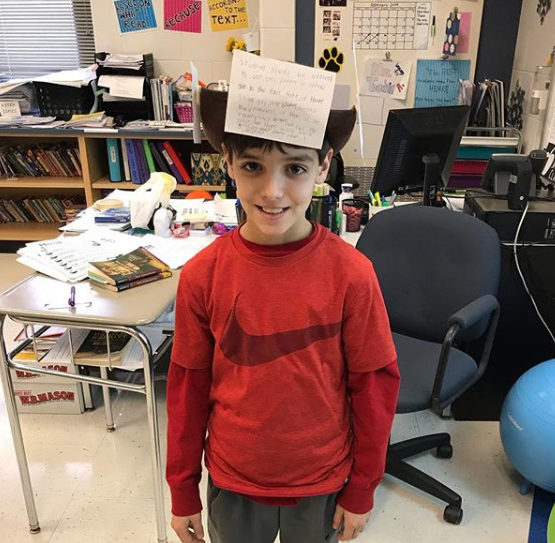 They then attached their "HAT" writing tasks to their hats! 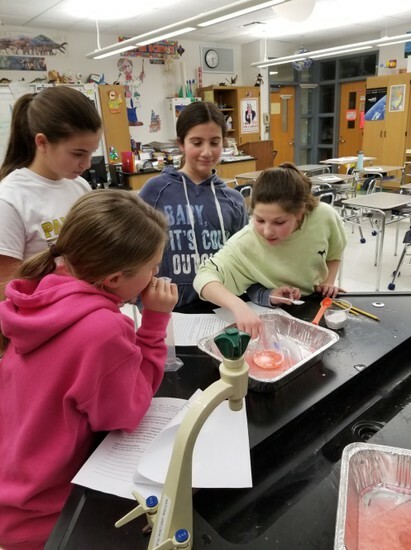 MMS 6th grade students modeled volcanoes in science class and studied pyroclastic flow by adding different size plastic beads. These beads represented rock and other material that can be expelled by a volcano. Students were asked to consider why some of the volcanoes in class had a lot of beads expelled while some only had one or two. 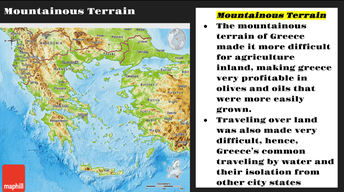 They also needed to identify their volcano as a shield, stratovolcano or a cinder cone and explain why. 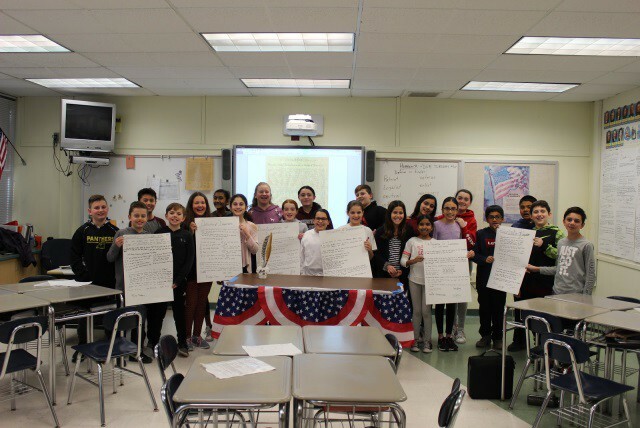 MMS 6th grade social studies students wrote their own Declaration of Independence using the same format as the original Declaration of Independence. 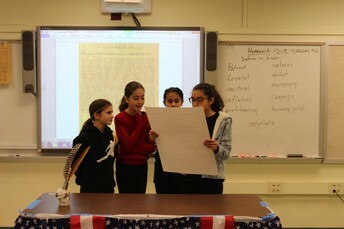 Their document included a preamble, an original statement of rights, list of grievances and statement of independence. Like it was in 1776, students had to put aside their personal preferences/opinions and, as a group, agree on every word that was written in their final Declaration. 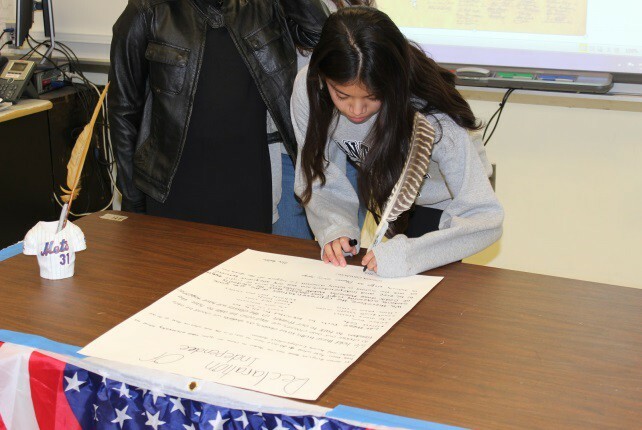 Students then participated in the "signing ceremony" (complete with quill pen!) and publicly read their Declarations. 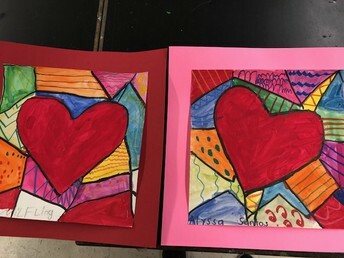 All of the students' work is proudly displayed in their classroom on "Independence Wall". 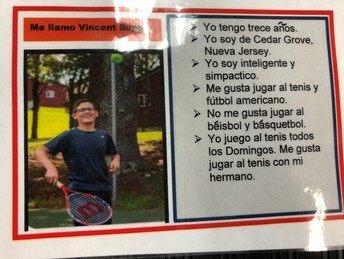 MMS 7th grade world language students learned about sports and created their own personal trading cards in spanish that included descriptions of themselves and information about which sports they like and dislike. 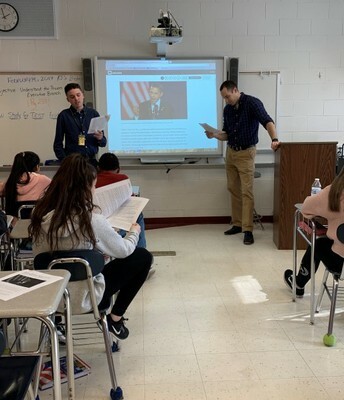 MMS 7th grade social studies students participated in a discussion/Q&A session on the first African-American president, Barack Obama. 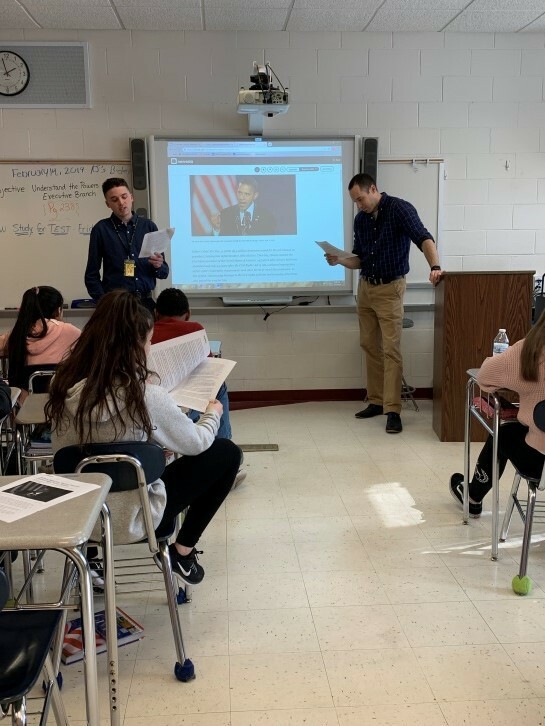 They studied the impact of the first African-American president and how his presidency will be beneficial to presidential races yet to come, having infused diversity into the Oval Office and thus empowered others of different races/genders to run for the highest office in the land. MMS 7th grade English classes wrote and read aloud a eulogy written for one of the characters that passed away in John Steinbeck's novel The Red Pony. 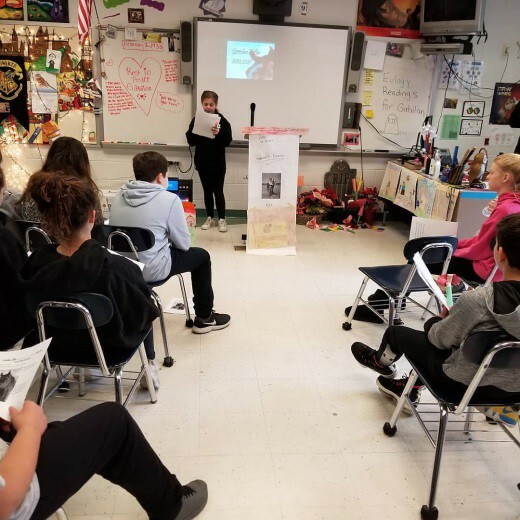 The classroom was set up to represent a funeral setting with a microphone, seating arrangements, a podium, pamphlets, a flower display and casket for the deceased pony. 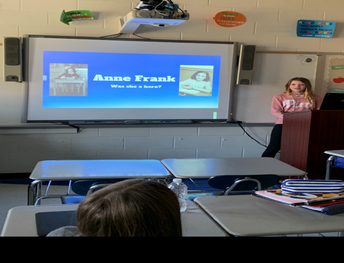 students wrote persuasive essays in which they argued for or against their topics and supported their arguments using peer reviewed articles. 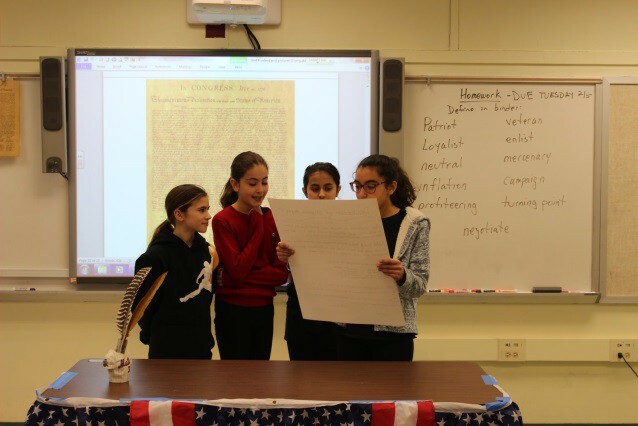 After their papers were written, students presented their findings with the help of a visual aid. 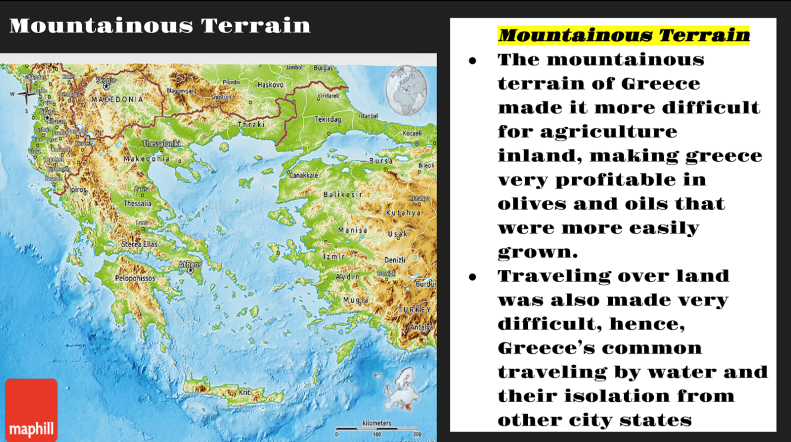 MMS 8th grade social studies students synthesized a Google Slides presentation that included a map representing particular geographic characteristics alongside accompanying explanations based on map data, small introductory instruction and student inferences. 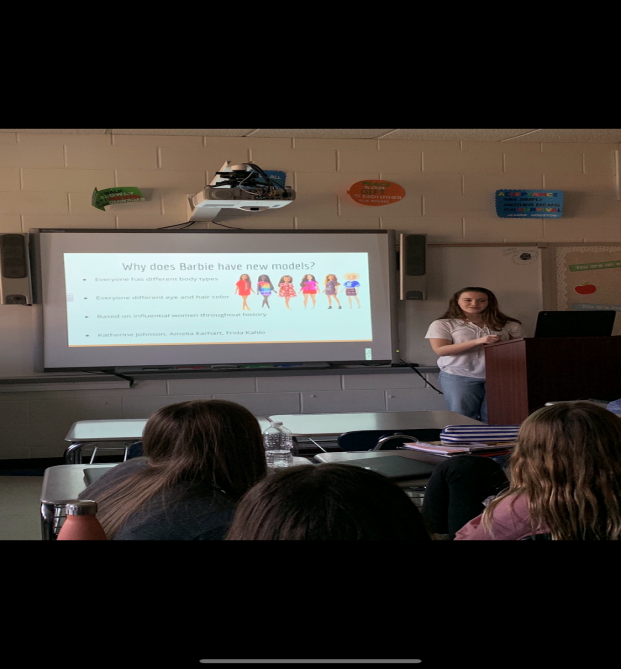 The closing activity asked students to present a map, focusing on the characteristics that could be ascertained and relationships that could be identified. 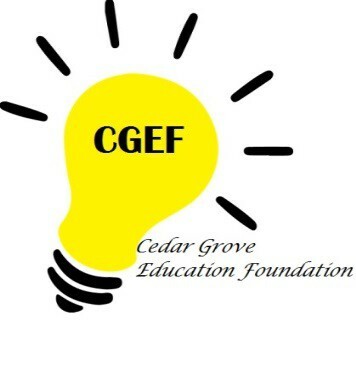 CGHS Student of the Month Selections Announced! 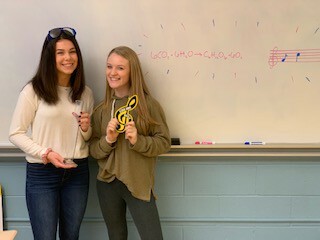 Congratulations to Maggie Brancato (Science) and Abby Buckworth (Music) for their selection as CGHS Students of the Month! Maggie is a Senior at CGHS and will be majoring in Mathematics in college next year. She would like to pursue a career in the Math/Science field. 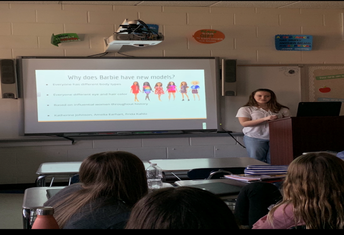 She enjoys English and science classes and is also involved in Peer Leaders, All School Council, National Honor Society and played soccer all four years! Outside of school, Maggie loves to shop and do outdoor activities! Abby is a Senior at CGHS and will be majoring in communications in college next year. She would like to pursue a career in Marketing or Public Relations. 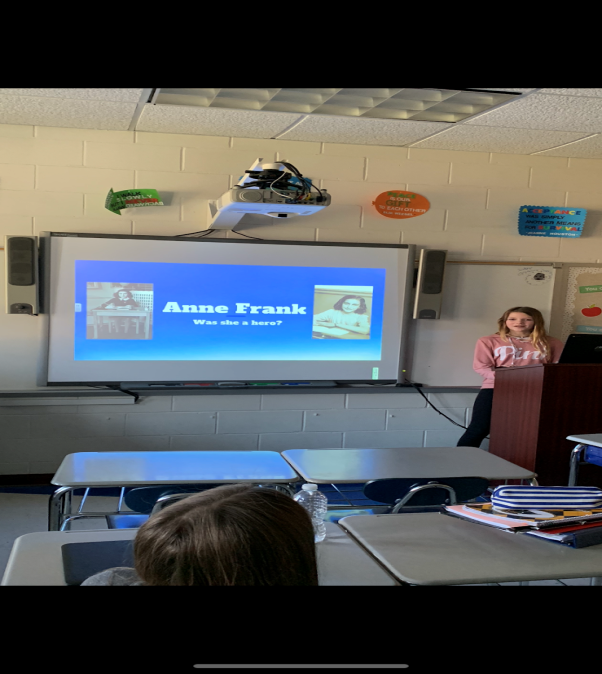 She enjoys English and music classes and is also involved in the Musical, Cheer, All School Council and National Honor Society. Outside of school, Abby enjoys playing the piano and hanging out with family and friends! Each bracelet provides Kenyans with 200,000 gallons of clean water. How cool is that?!?! 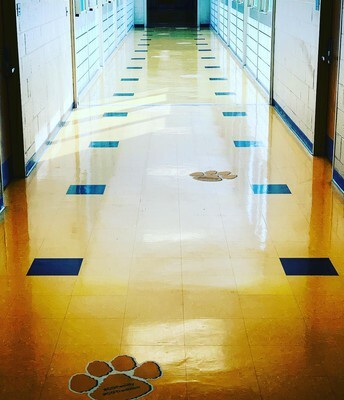 Check out the newest addition to the CGHS hallways! These amazing paw prints highlight our CGPantherPride hashtags: #cgfamily #cgtradition #cgexcellence #cgcommunity. What can we say? 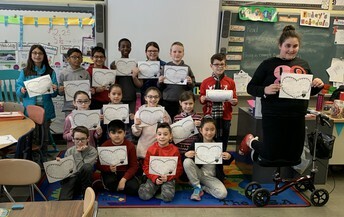 #WeAreCedarGrove! 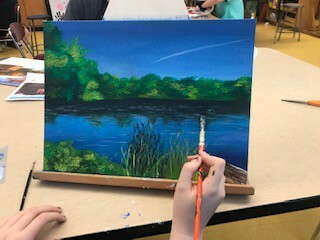 CGHS art students are working on landscape paintings in acrylic paint. 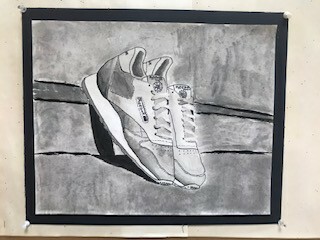 and still life of shoes in ink wash. We have some talented students in the CGSD, don't we?!?! 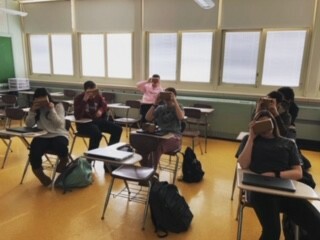 CGHS students in Mrs. Schomaker's US History II class used Virtual Reality technology to visit D-Day. 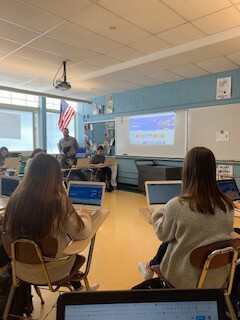 CGHS students in grade 9 took part in a cross-curricular lesson developed by Mr. Tedesco and Ms. Angione that used coding to create a Russian Revolution storybook project. Pictured here is the winner of the HS Division, The Above Average Joes! 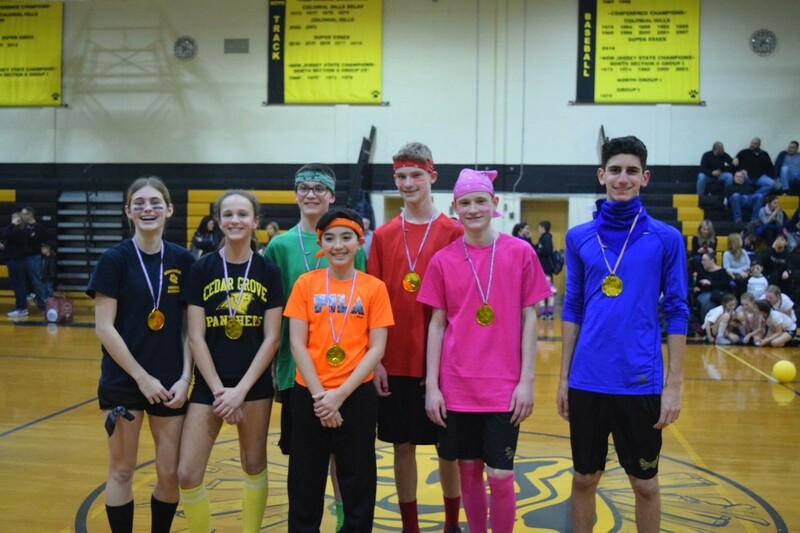 Pictured here is the winner of the 7th/8th grade division, The Ball Dodgers! 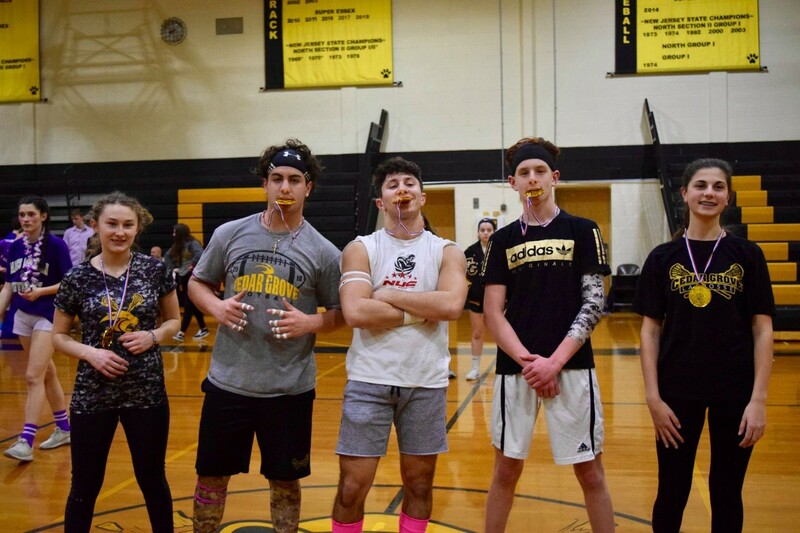 Pictured here is the winner of best costume, The Granny Squad! 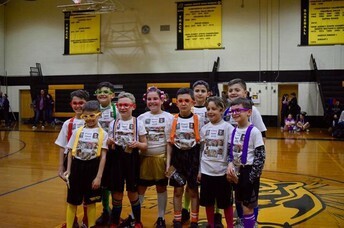 Congratulations to all for a highly successful LAX fundraiser!